I have FOUR other outfit posts waiting to publish, but I just couldn’t wait to share my Miami photos with you! On our first day, Esther and I spent the afternoon in the Wynwood neighborhood. 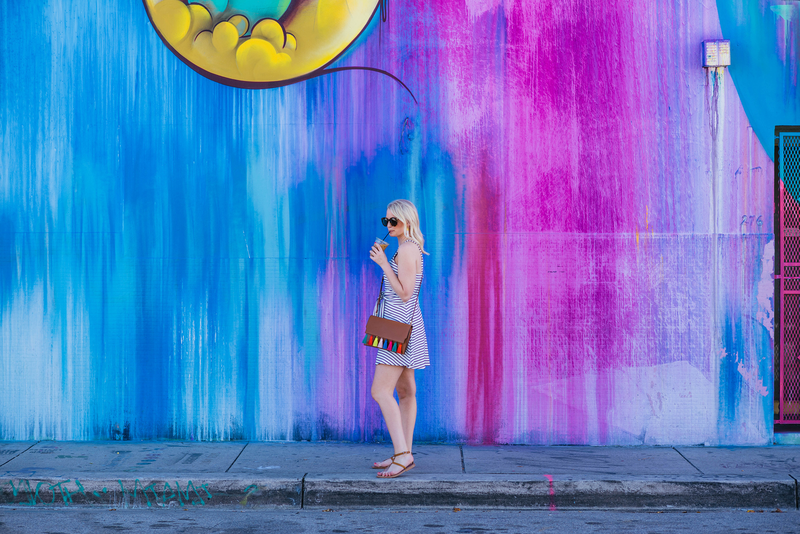 Here you’ll find incredible street art on every corner, also known as the Wynwood Walls. It’s the perfect backdrop for spring/summer outfits, don’t you think? We had so much fun capturing some looks at this spot! In addition to all the color and inspiration, there are a bunch of great little eats nearby – we grabbed coffee at Miam Cafe, which just so happens to be housed in a massive black and white striped building. So charming and adorable – and DELICIOUS coffee! This dress is the ideal summer frock, in my opinion. 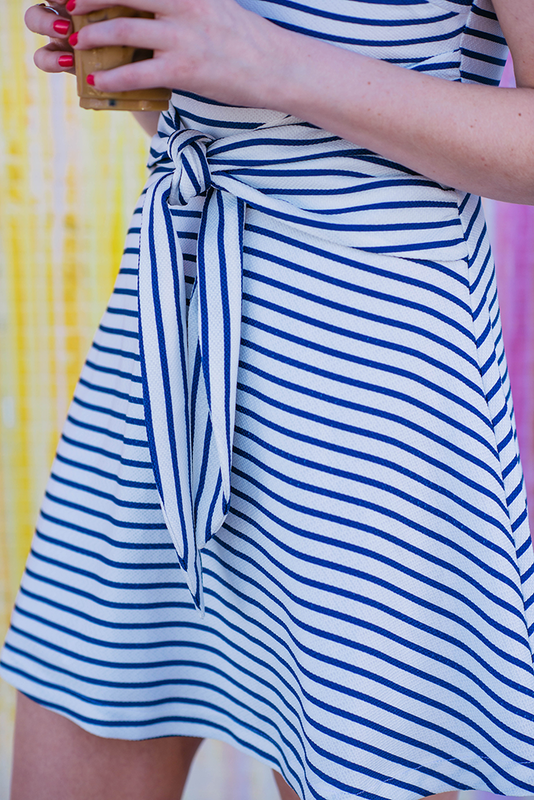 First, stripes just go hand-in-hand with the season – that’s just the way it is! The tie-front style is flattering while also giving it an effortless chic vibe. This dress is just so easy to throw on and go. Did I mention it’s only $88?! To add a pop of color to the look, I paired it with my new Rebecca Minkoff tasseled bag. 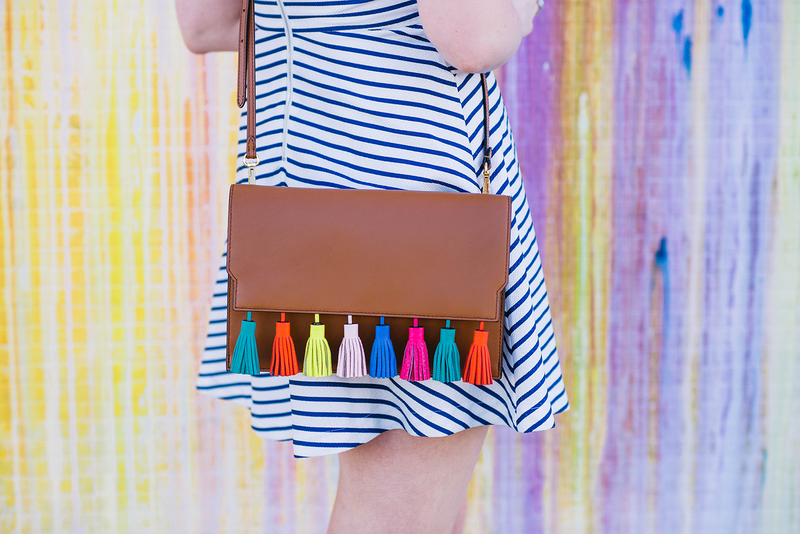 The multi-colored tassels make it versatile in my summer closet of whites and brights, and the style is convertible to either a cross-body or a clutch. So useful and fun! Stay tuned for more photos from Miami! Wynwood is such a fun area to be creative, enjoy your stay in my City. super cute bag! These photos are so striking…I’m loving the stripes against the vibrant background. This is gorgeous!! I’ve been eyeing this dress but have been torn between it and another by the same brand that is the same fabric just slightly different shape! Both are so darn cute & summery! Do you mind me asking if you’re in a size small? And the fabric has no give, right? Currently between sizes! Hope you’re having a great time in Miami! Looks like a blogger’s paradise with all the colorful walls!! I’m wearing a Medium! Yeah it’s not very stretchy. Hope that helps! Such a cute dress! How does the sizing run? Do you think I should order a small? either that or an XS – I’m wearing a Medium! What a perfect spot for photos! Especially with your colorful bag and great dress! Love the tie waist. Sounds like you are having a great time. That tie waist detail is the cutest! Can’t wait to see more pics from Miami! What a cool location for pics!! 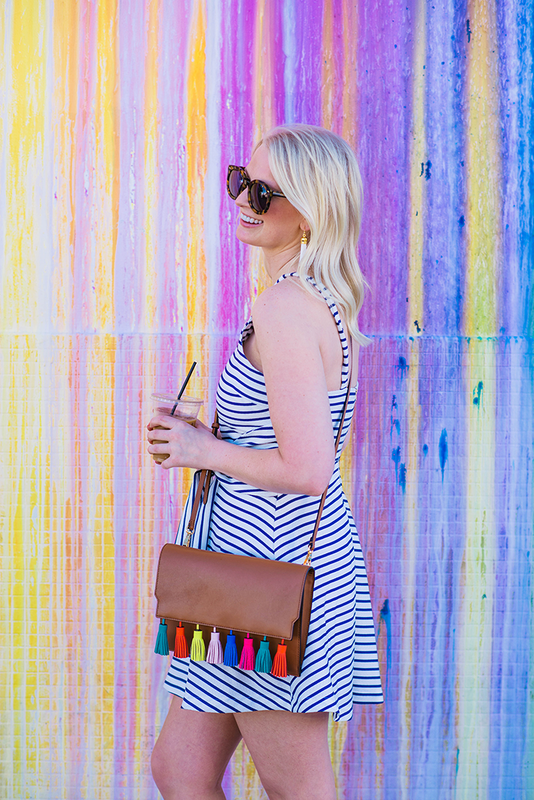 Love your tassled bag and that striped dress is perfect for a warm weather getaway! So cute bag, great dress and amazing background. I had no idea there was such a place in Miami! One more reason to put it on my bucket list! I am so obsessed with that bag! I need it in my life! What size earrings are yours? I see small, medium and large on the site! 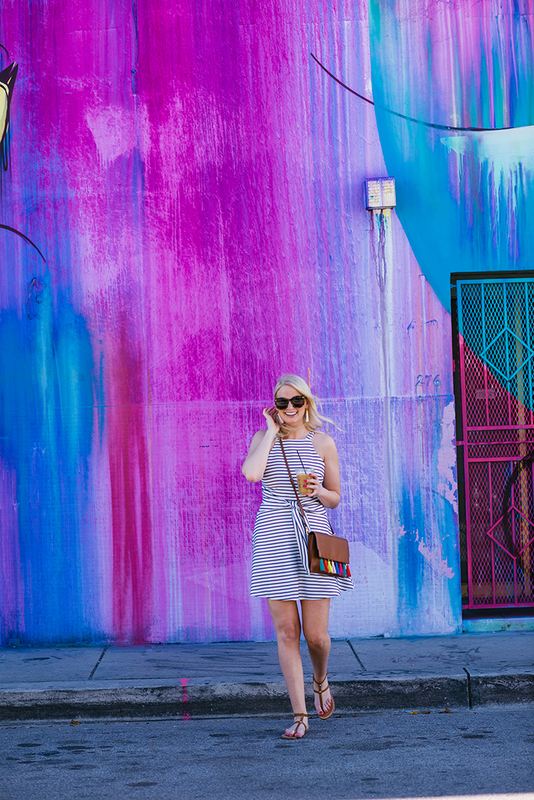 You look so gorgeous in these pictures, as does the background of Wynwood Walls! I grew up in South Florida so I always love seeing pictures like this! This wall is gorgeous! I LOVE that your purse happens to match it perfectly. I love the size and shape of that purse. Love this look and ugghhhh I want a replica wall in NYC! This dress is so cute! I’m a sucker for stripes and you pull them off so well. 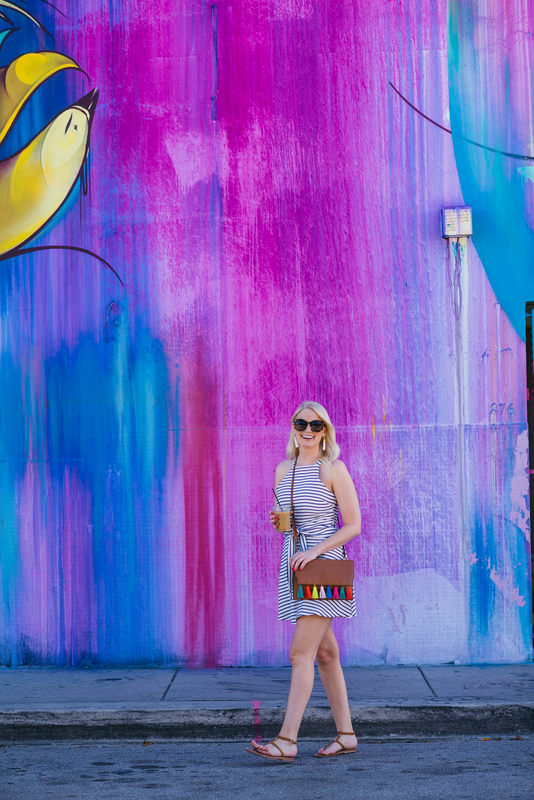 I also love the pop of colour in your bag and in the street art in the background!